From leading Old Testament scholar Douglas A. Knight comes the latest volume in WJK's Library of Ancient Israel series. 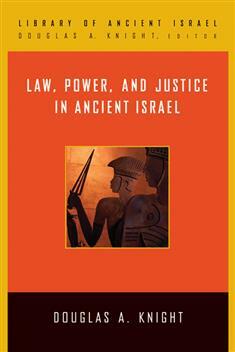 Using socio-anthropological theory and archaeological evidence, Knight argues that while the laws in the Hebrew Bible tend to reflect the interests of those in power, the majority of ancient Israelites—located in villages—developed their own unwritten customary laws to regulate behavior and resolve legal conflicts in their own communities. This book includes numerous examples from village, city, and cult. Volumes in the Library of Ancient Israel draw on multiple disciplines—such as archaeology, anthropology, sociology, linguistics, and literary criticism—to illuminate the everyday realities and social subtleties these ancient cultures experienced. This series employs sophisticated methods that depict the reality of the people behind the Hebrew Bible and interprets these insights for a wide variety of readers. To listen to Doug Knight's interview about this book on WJK Radio with Dan and Jana, click here.